The White Cottage - Hartenbos Accommodation. At this charming self-catering cottage it is all about the view. 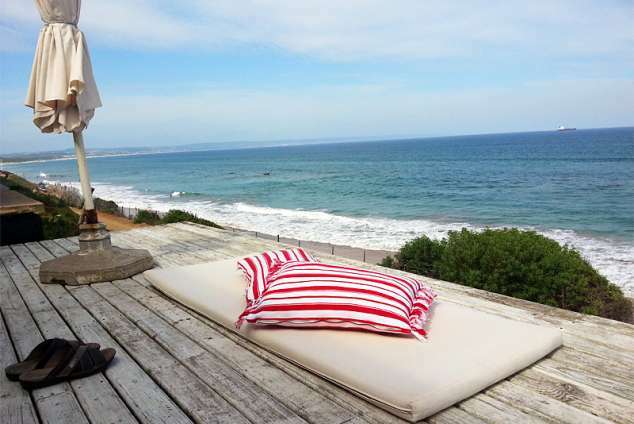 It's beach front location presents a spectacular 180° unobstructive ocean view. This beautifully 'chabby chic' decorated cottage accommodates 6-8 people. there are four rooms, two with double beds and two with twin beds. The house has two bathrooms and one unique outside shower with warm water. A cleaning service is available at an affordable price. The house is in a private secure street and there is 24h security in the area. Long walks on the lovely beach or relaxing on the deck will be high on your agenda. The noise of the sea and the waves are mesmerizing. NB: Please check calendar for availability before enquiring. 56248 page views since 13 Oct, 2011.